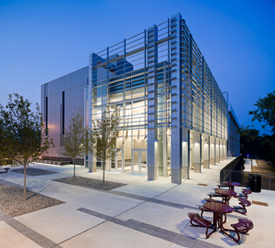 DECEMBER 2012 — A state-of the art lecture hall and classroom building in Raleigh, North Carolina has officially received its LEED® Gold certification by U.S. Green Building Council. Located on Wake Tech Community College’s Northern Campus, “Building E,” is the fourth academic building on this rapidly expanding campus. and a green rooftop terrace. Other LEED® features include daylight harvesting, shade louvers on the south side, low-flow restroom fixtures, and no-irrigation landscaping, resulting in over 50% reduction in energy use and over 40% reduction in water use. “Our folks are much more than excited about Building E and securing LEED® Gold reinforces Wake Tech’s commitment to sustainability. This was all made possible by your (project team) commitment and hard work and it is appreciated very much.” Shared Goodwin. Building E was designed by Clark Nexsen Architecture & Engineering and constructed by Edifice, Inc. The project, noted by its unique mix of materials and striking appearance, has received much attention as of late. In November, the building also received a top award as a part of ABC of the Carolina’s Excellence in Construction Awards. “Edifice is honored to have been a part of the process in working with Wake Tech as they expand and strengthen their academic opportunities on campus,” says Tim Clark, Project Manager for Edifice. “We especially enjoyed the opportunity to utilize our LEED® accredited staff and our background in sustainable construction to support Wake Tech’s efforts to create a healthier environment. Wake Technical Community College is North Carolina’s second largest community college, serving more than 68,000 students annually with five campuses, two training centers, multiple community sites, and a comprehensive array of distance learning options. Wake Tech is fully accredited and offers more than 165 associate’s degrees, diplomas, and certificates that prepare students for university transfer or immediate employment. Non-credit continuing education programs provide customized workforce training, small business support, public safety officer training, and basic skills courses such as English as a Second Language and high school equivalency preparation. Wake Tech also offers a variety of courses for personal enrichment. For more information, visit www.waketech.edu.